It’s finally here! A brand new recipe! 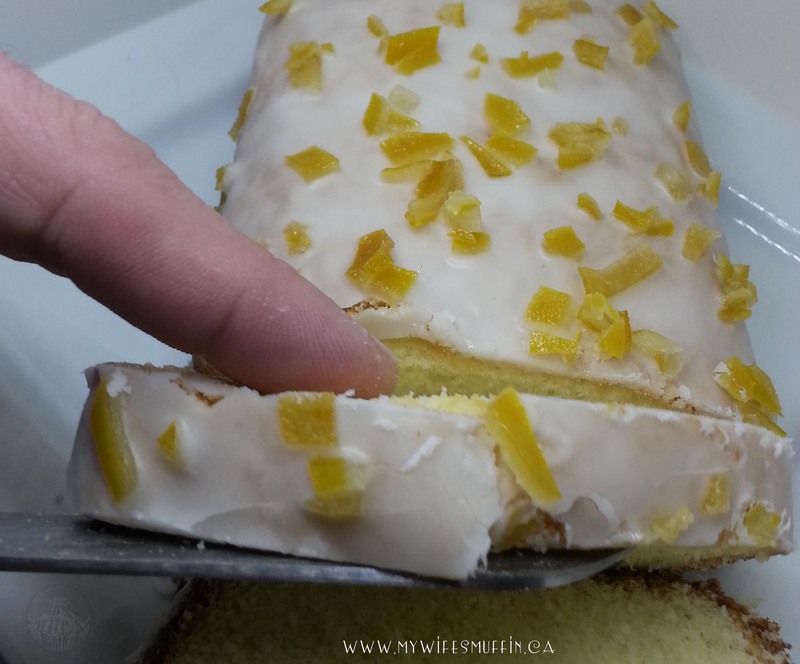 We know you’ve been waiting a while for us to serve up something new, and this Lemon Sponge Loaf is definitely worth waiting for. The candied lemon peels alone are worth the wait. Never made candied lemon peels? It’s so easy, and they taste great! Just like candy. We had a hard time saving the bits of lemony garnish, as they were so addictively good. We can’t wait to try candied orange peels too! 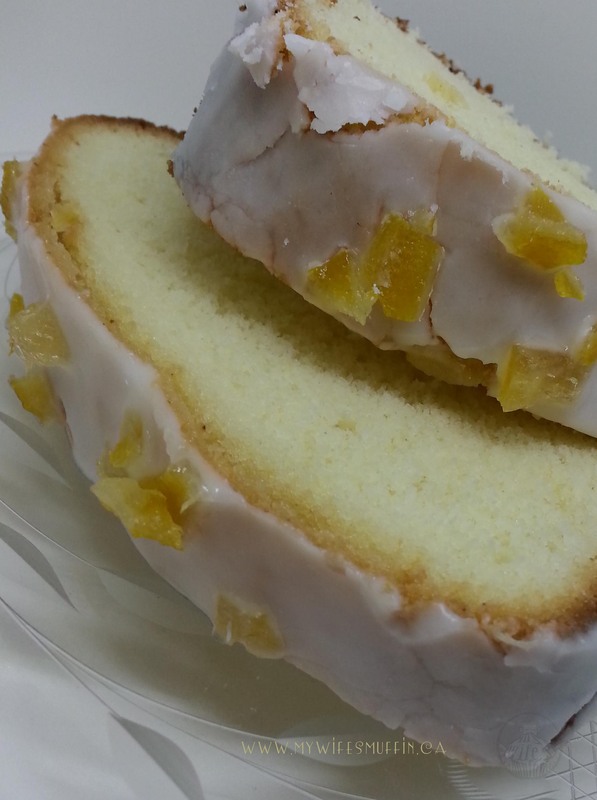 Now back to this Lemon Sponge Loaf, or more precisely, why it took us so long to develop another recipe. We’ve had a bit of trouble with dishwashers over the last four months. It started when the power went out one day during a storm, and suddenly our dishwasher panel started flashing and the dishwasher stopped working. After resetting the dishwasher computer (I’m ready to go back to dials and knobs any day now), it began to work again – but, not for long. The factory reset failed to revive our now dead dishwasher. That was early November… and knowing that there were going to be some great Boxing Week sales coming up, we decided to wait just a bit to get a new dishwasher. Well, that’s when the apocalypse hit our kitchen. It’s been a while since we’ve been without a dishwasher, so we weren’t really prepared for the mess and work involved in handwashing dishes. After a while, the dishes began to pile up… and pile up. Dish duty became a relentlessly long chore, so did preparing any kind of food because well, there was always a mess to clean up first. The problem is that we’re a busy household. And none of us realized how much time dish washing can take up in a busy day, especially when you’re trying to develop recipes for a food blog. So, we took a break from recipe developing for a couple months in order to save our sanity. Our new dishwasher arrived in mid-January (courtesy of an awesome Boxing Week sale… patience is a virtue and can save you money…. but not always headaches as we soon learned). Something didn’t seem quite right with our new dishwasher from the get go. The door was suspiciously easy to open. Of course, this was our first brand new dishwasher, and it was a really nice dishwasher. Maybe the door was supposed to be like that? Only one way to find out – do a load of dishes. Automatic dishwashing glory took place for a few cycles, until one day the door began to slowly pop open and condensation built up on the control panel. Huh. Pretty sure that’s not supposed to happen. We pulled out the dishwasher to have a closer look at the hinges on the bottom, and discovered that the frame looked very bent and warped – as if the machine had been dropped off a truck (just a guess). So, we had to call the manufacturer who schedule a maintenance visit. Two days later, the maintenance guy showed up, took a quick look and said there’s nothing I can do about your bent frame, but I can order you a new door lock because this one is broke. Huh. He also advised us to contact the store because the machine should not have been delivered to a customer in that state. So, this is where we are at. We can do dishes, very carefully, in our brand new dishwasher… but, you know, we didn’t pay for a dishwasher that was defective. Hopefully, we’ll hear back from the store soon to rectify the situation. Even though we have a defective dishwasher which has soured our mood, we still wanted to get a recipe together, particularly since Mae had been developing it for a couple weeks. 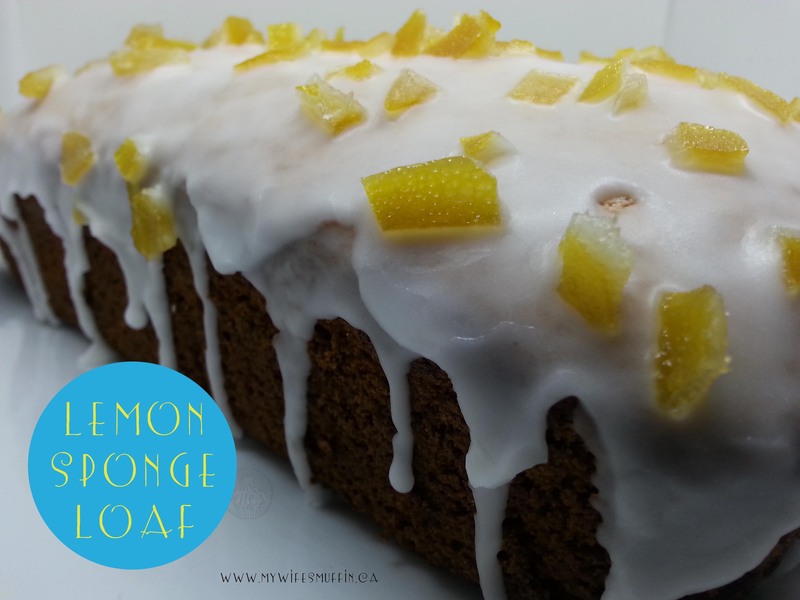 Lemons always seem to brighten up any dish, so Mae reckoned that her Lemon Sponge Loaf would brighten up her mood about the ‘new’ dishwasher. Boy oh boy did she ever kick it up a notch with this Lemon Sponge Loaf. The flavour is amazing – pure lemony goodness. Begin by making candied lemon peel. Slice 3 lemons approximately ¼ inch thick slices. Cut slices in half to form half-moon. Remove pulp leaving rind and pith (the white part of the rind). 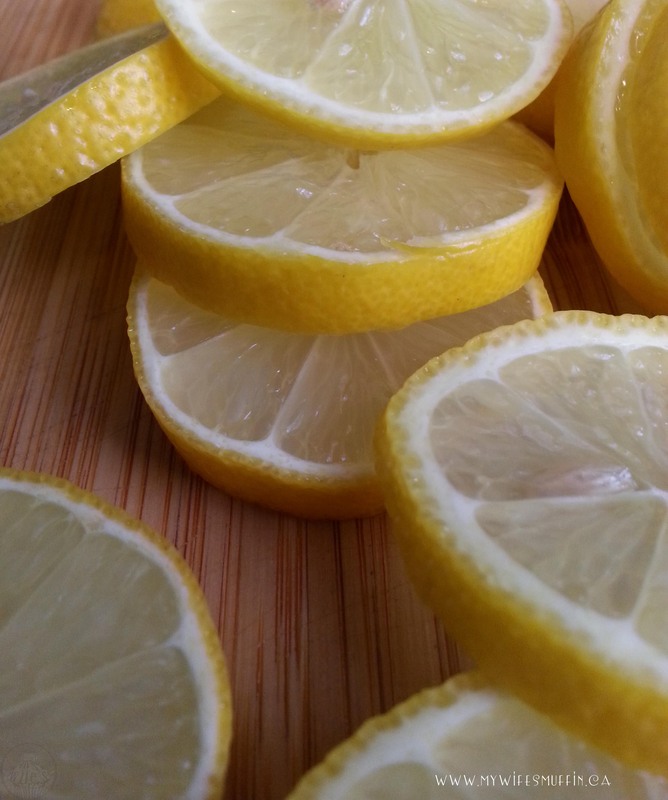 Boil lemon peel in cold water. Repeat process three times total (to remove bitterness from rind). Drain rinds and set aside. Combine 2 cups of white sugar and 2 cups fresh cold water in saucepan. Stir to dissolve sugar while bringing to a boil. Reduce heat to low simmer. Stir in lemon rinds. Simmer until pith is translucent. Strain rinds, reserving lemon syrup in separate container. Spread lemon peels out on parchment paper, and allow to dry slightly before tossing with additional sugar. Set aside candied lemon peels for garnishing. Lightly grease two loaf pans (we used coconut oil). Begin preparing lemon sponge cake by sifting flour and baking powder in a medium bowl. Set aside. In a large mixing bowl, beat egg and salt until thoroughly combined. Gradually add sugar, continuing to beat until fully blended. Add flour mixture and lemon syrup alternately in batches. Blend between each addition. Process batter until light and fluffy. Stir in lemon zest and extract. Divide batter between two prepared loaf pans. Bake for 25 – 30 minutes or until golden brown or toothpick inserted comes out clean. Remove from oven and cool on wire rack for 15 minutes before loosening edges with knife and flipping lemon sponge loaf out. Allow to cool completely before garnishing with icing and chopped candied lemons. To prepare icing combine icing sugar, lemon syrup, and 2 tablespoons of water. Blend thoroughly, and continue to add small amounts of water and icing sugar until desired consistency is reached.